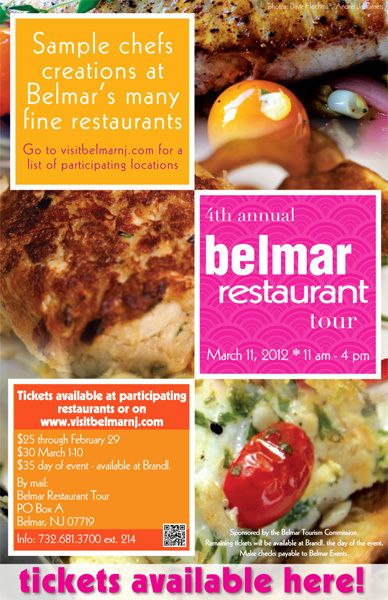 The Belmar Restaurant Tour on March 11, 2012 offered visitors a taste of almost 30 Belmar restaurants. I always like a nice food festival. And the Belmar Restaurant Tour, on March 11th 2012, sounded like a great occasion to visit a lot of places I’ve heard of but that I’ve never visited before, all in the Main St / 10th-8th Ave area. This was one of those buy-one-ticket and visit-all-restaurants deal, with the price ranging from $25 in advance to $35 on the day of the event. The first disappointing thing was that there was no alcohol included. I thought it would be like the Taste of Sea Bright (still the standard, in my opinion), where the food fest can also be called a bar crawl (it’s true that tickets there are $40). Surf Taco: I like this place, but couldn’t try anything, since at the time when I arrived they only had veggie tacos (which I don’t do) and I didn’t want to wait for the chicken ones to be ready. Nicchio: A very nice restaurant, definitely to be visited again. We got some pasta there and it wasn’t the plain kind, it was very tasty. Tulipano: A small slice of tomato pizza, delicious! Brandl: I was looking forward to see this culinary powerhouse. In a nice setting in the Belmar Plaza, it’s a BYOB restaurant known for the innovative cuisine of Chef Brandl. We got there something pretty fancy, and I really don’t remember the name or what exactly was in it, but what’s important is that it was outstanding. Belmar Bagel: I liked the many choices of flavored cream cheese, and a nice treat for the kid. 10th Ave Burrito: I would’ve expected a burrito or at least something Mexican, but the sample was a chicken wing with a spicy dip. Not bad, the dip was good, maybe it’s a house specialty. Kotta Sushi: There was a vegetarian roll to try (which I didn’t) and some very cool “salmon salsa” – a potato chip with a thin slice of salmon sushi (raw), interesting and tasty combination. Jersey Shore BBQ: Quite a surprise for a fast food place, the pulled pork with cole slaw were very good! Although the gutted darkened pig on the counter might be a turn off for some people (but not for me, of course). Mike’s Giant Submarines: Simple sub pieces, and I found out they’re not part of Jersey Mike’s, but they split from it about 20 years ago. 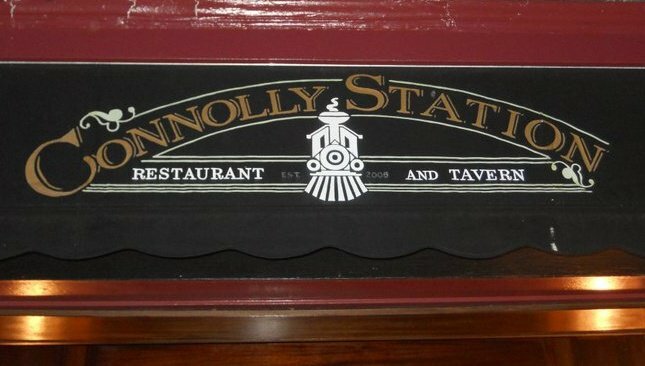 Connolly Station: Again I place that I’ve heard a lot about. An old-school bar, cool atmosphere, but it had a more elegant dining area too. Great occasion to have a beer and clear the palate, while enjoying the penne pasta they offered to sample. I found it pretty similar to the Boathouse. Freedman’s Bakery: After so much food and finally a beer, we got dessert! I had the pineapple cheesecake, but there was a huge variety, and my group also tried raspberry cheesecake and a coconut pie. They even gave my kid a free pastry. Jack’s Tavern: On the way back to the car, a quick stop, and another nice surprise, a delicious cajun shark bite! 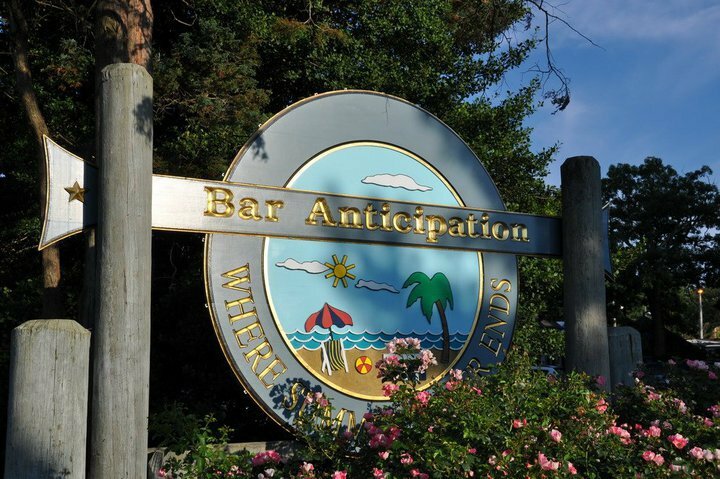 Bar Anticipation: Finally a familiar place, and one of my favorite ones. This was really the cherry on top. It was almost like in the summer, big crowd at the outside bars, drinking beers in the sane between the cabanas… And the food wasn’t bad either, they offered corned beef sliders and I needed to have 2! Overall it was a nice experience. Good food and nice spring weather! Would’ve been better with alcohol samples or at least would’ve attracted bigger crowds), but I would do this again for sure!